Happy 2016 Mayhem & Mystery friends! Thank you to each and every one of you who joined us in 2015. We enjoyed every unique performance with you. And there is still more to come. This year will be adding a new website, in addition to the current blog site at www.mayhemmystery.us. You can find the best updates, photos, and performance schedule by visiting our Facebook Page under Mayhem & Mystery. Mind-boggler" will run through March 8, 2016. Make reservations at the Spaghetti Warehouse now by calling 937.461.3913 for Dayton or 614.464.0143 for Columbus. We will be helping Vandalia Youth Theatre with a fundraiser on Saturday, February 20, as well. Grab your beads, Mardi Gras colors (purple, green, and gold) and a mask and be part of the interactive mystery fun. Here is the inside of our 2016-2017 Season Brochure with our upcoming shows for this year. You can get a full Brochure by attending one of our performances or by stopping by the Spaghetti Warehouse. 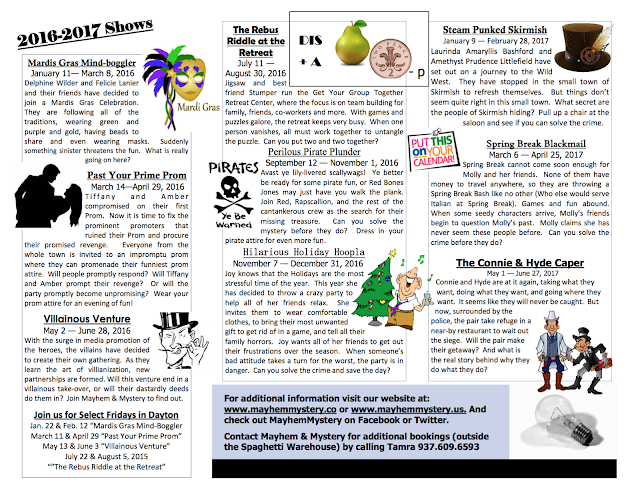 We look forward to seeing you in 2016 for interactive mystery theatre fun!